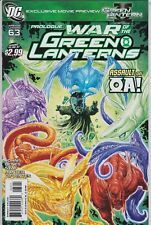 Green Lantern #63 +#64 (2011, DC) War Of The Green Lanterns! GREEN LANTERN 63...NM-...2011...Geoff Johns,Ed Benes!...Bargain! Green Lantern #1! (2011) B/W Variant! Signed by VCA Greg Capullo! NM! COA! This page was last updated: 22-Apr 14:01. Number of bids and bid amounts may be slightly out of date. See each listing for international shipping options and costs.